As a 19-year-old Israeli soldier, Ari Folman took part in the 1982 invasion of Lebanon and was on duty in Beirut during the notorious massacres in the Palestinian refugee camps of Sabra and Shatila. Just a week ago, Waltz With Bashir, the animated documentary film Folman directed in which he explores his own nightmarish, half-suppressed memories of that period, was given its first underground screening in Lebanon  not far, in fact, from Hezbollah headquarters in southern Beirut  though the film is officially banned in that country. It has also been screened in Palestinian Ramallah and is reportedly soon to be shown in the Arab Gulf states. It has already won six Israeli Academy Awards, best foreign film at the Golden Globes, and is now nominated for an Oscar as best foreign film. At this moment, when the Israeli assault on Gaza has ended in catastrophic destruction and death, director Folman’s remarkable voyage  he calls it a “bad acid trip”  into the oblivion of war trauma and the horrific recent history of the Middle East is as stunning, moving, and unnerving an experience as anything you’ll see this year, or perhaps any year. 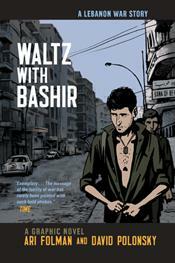 A no less remarkable graphic memoir, Waltz With Bashir, was developed in tandem with the film. It will be in your bookstores in a couple of weeks, but can be ordered in advance by clicking here. Not surprisingly, the book and film have some of the impact that the first “graphic novel,” Art Spiegelman’s MAUS, had when it came out in 1986, and that assessment comes from the fellow  me, to be exact  who published MAUS back then.